The annual Most Inspiring Students dinner, sponsored by the Long Beach Education Foundation, recently honored one student from each school in the Long Beach Unified School District. The keynote speaker was Damon Dunn, who overcame a difficult childhood to eventually play football at Stanford University and in the NFL before building a successful real estate business. Frank Mottek, news broadcaster for KNX Radio, co-emceed the event with Mike Murray of the Long Beach Education Foundation. The event theme this year was "Super Heroes” with entertainment provided by vocal soloists Diana Michel and Jennifer Rockett, along with the Wilson High School Jazz Band. • has made a dramatic improvement or turnaround. Proceeds of the event support the Long Beach Education Foundation charities with grants, school uniforms for students whose families cannot afford them, scholarships and other assistance. 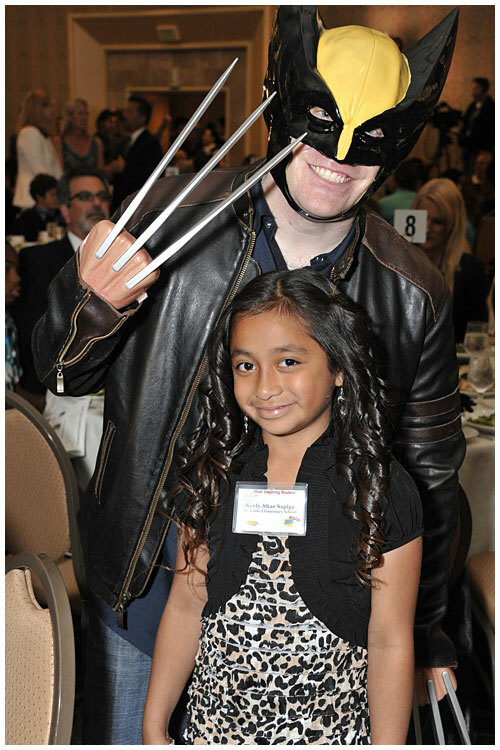 SUPERHEROIC—Millikan High School and Cal State Long Beach graduate Dylan Seal provides entertainment at the superhero-themed Most Inspiring Students Awards, where Alvarado Elementary School student Keely-Chae Sapiga (in the larger version of this photo) was one of the honorees.